St. Patrick's Day is one of my favorite holidays. (I'm going to be honest with you, I love most holidays. You'll hear me say this again at Cinco de Mayo and Halloween.) Any day that encourages revelry and good times is a-okay with me. And add to that that I actually am Irish (somewhere down the line, according to Ancestry.com), that's even more reason to celebrate! In the past, as a typical American, this meant copious amounts of green beer (so, so much cheap green beer), corned beef sandwiches, cabbage and potatoes, and (more than) a few Jameson + gingers for good measure. Obviously, as a keto convert, most of that is out. Gone are the empty carbs of green beer (and good riddance, honestly), buh-bye to the bread on my sandwiches, and adios to the ginger ale with my Jameson (I've switched to club soda instead, so all is not lost). But what about the cabbage and potatoes? Surprisingly, that was the hardest for me to wrap my head around. So, you know how I do, Glow Getters...I had to keto-fy it. The results were so delicious that I realized I had to share it with the world. Prepare to have your mind blown. Introducing keto colcannon. Colcannon, essentially, is an Irish dish of mashed potatoes and kale or cabbage mixed together. In Ireland, it’s traditionally served on Halloween, but in classic American fashion, I do all my Irish stuff on St. Patrick’s Day. Recipes for colcannon vary—I would think that the variations are not unlike any other variation on traditional foods with family recipes battling each other for the title of “best.” One thing is clear though, and that’s that colcannon must have two three things: mashed potatoes and cabbage (or kale), mixed together and topped with a pat or two of butter. This was the perfect keto storm for me. 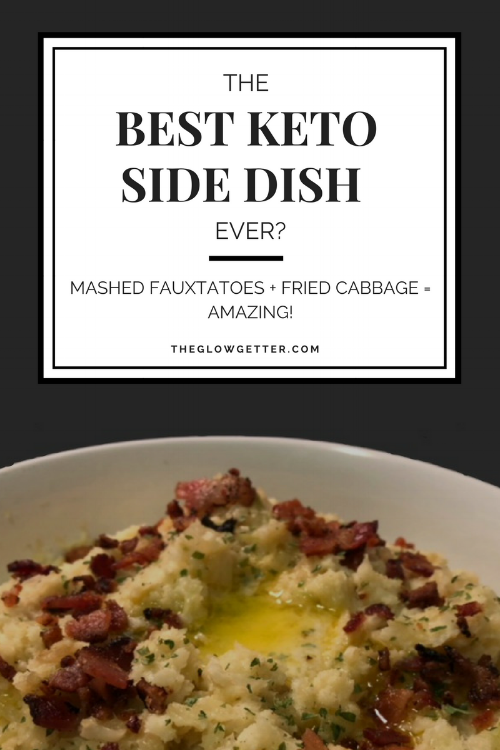 Having already perfected mashed fauxtatoes (mashed cauliflower), and having fried cabbage as one of my back-pocket go-to recipes, it was just a matter of putting them together. I’m so glad I did, and I think you will be, too. You know what? Let me stop yappin’ so you can get the recipe and try it for yourself. Let’s get to it. First, start on the mashed fauxtatoes. Separate head of cauliflower into individual florets unless using pre-cut florets. Put florets in the microwaveable bowl and add 2 tbsp of heavy cream and 2 tbsp butter. Microwave, uncovered, for 6 minutes. After 6 minutes, remove bowl from microwave and stir to coat the cauliflower with the melted butter and cream. Microwave again, uncovered, for six minutes. While cauliflower is cooking, start on the cabbage. Fry bacon or ham chips in your pan or dutch oven until crisp over medium heat. When done, set aside on a paper-towel lined plate to absorb excess grease. To the pan with the rendered bacon fat, add 1 tbsp butter and diced onion. Cook over medium heat until onions are soft and translucent. If necessary, lower heat to prevent them from burning. To the pan with the softened onions, add cabbage in batches, stirring to coat in the fat, until all the cabbage fits in the pan. Cook, stirring frequently, until cabbage is soft (about 5-7 minutes on most ranges). Remove cabbage from heat and set aside. Back to the cauliflower: Use your immersion blender/food processor/blender to blend cauliflower, milk, butter, 1 tsp chicken bouillon base (if using), and parmesan cheese until smooth. If necessary, add more cream until you reach your desired texture. Taste, and add more bouillon base or salt and pepper as desired. In the same bowl the cauliflower was cooked in, mix mashed cauliflower and fried cabbage thoroughly. Chop bacon, and scatter over top of cauliflower/cabbage mixture. Make an indentation in the middle of the mixture, and nestle in remaining tbsp of butter. (If using) Top with chopped scallions. I hope I didn’t oversell this, although I’m not sure if that’s possible. Usually, mashed cauliflower can be hit or miss and serve as a poor substitute for mashed potatoes, but this method of making them never lets me down. I even had heavy carb eaters asking for more of this delicious dish, and that is saying something in my house. The great thing about this dish is that although it seems like a lot of ingredients and a lot of steps, it can truly be made for under $10 and about 15 minutes, which is a super win in my book. Try it for yourself and let me know what you think in the comments! Is it a keeper for you?